Command Sergeant Major Amedeo Russo was born on June 29, 1975 and he enlisted in the Italian Army in 1994 at Cassino, Italy. He trained as a Mechanized Infantryman and graduated from Infantry School of Cesano, Italy. As an Infantryman, he has served in the following duty positions: Rifleman, Team and Platoon Leader, Military Instructor, S3 NCO, Company Sergeant Major, Joint Terminal Attack Controller and most importantly Kosovo Force Command Sergeant Major. Command Sergeant Major Russo’s overseas assignments include four tours in Kosovo, two tours in Afghanistan, and one tour each in Bosnia, Albania, Macedonia, Lebanon and Mali. His assignments in Italy include tours at 18Th Infantry Regiment Bersaglieri, 78th Infantry Regiment Lupi di Toscana and 8th Infantry Regiment Bersaglieri. His professional military education encompasses several courses including: Team Leader, First Sergeant, Advanced Leader, Senior Non-Commissioned Officers, Platoon Leader, Patrol Leader, Master Fitness Trainer, Crisis Response Operation, Parachuting, Basic Life Support, Military Driving Instructor, Counter Insurgency, Joint Terminal Attack Controller, Aquatic Rescue, German Certificate of Performance and Shooting. In addition, he attended the Master Resilience Trainer course in the United States in association with the University of Pennsylvania and the Command Senior Enlisted Leaders course at the NATO School in Oberammergau Germany. Command Sergeant Major Russo is also a graduate of the United States Army Sergeants Major Academy (class 65), in El Paso, Texas, town that has conferred him the honorary citizenship. 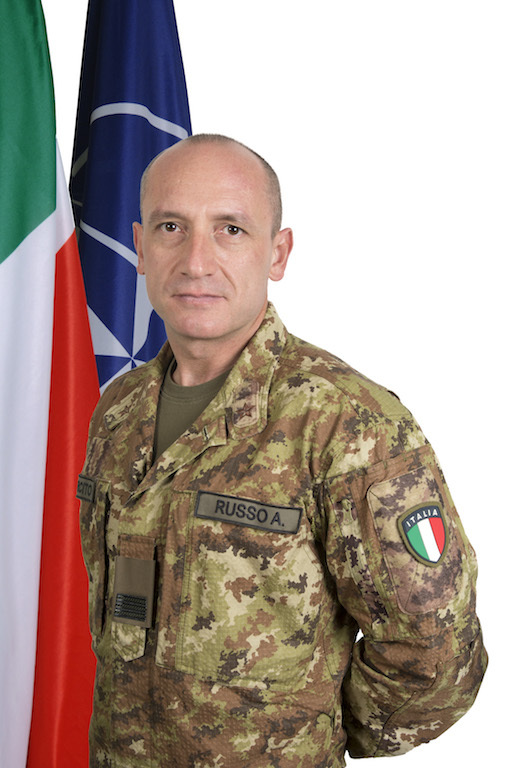 Concerning his civilian education, Russo is currently attending the Second University of Naples where he is pursuing his Master's degree in Law. Moreover, in 2013 he won a scholarship at the United Nations Food and Agricultural Organization in Rome where he was involved in research on biofuels and their impact on financial markets. In the same year, he took part in the most important multilateral diplomatic simulation process in the world at the United Nations HQ in New York (Special Committee on Peacekeeping Operations), where he studied the early stages of the crisis in Mali. He assumed his present position as HQ NRDC-ITA Command Sergeant Major on October 31st, 2016. Command Sergeant Major Russo’s awards and decorations include seven written honorary commendations for his exemplary performance in Albania, Afghanistan, United States, Kosovo and Mali. Additionally, he has earned the Commemorative Medal for his service in Bosnia, Albania, Macedonia, Kosovo, Lebanon, Afghanistan, Mali , the Medal for Homeland Security and medals by the Minister of Defence of Estonia, Slovenia, Portugal and Hungary. Command Sergeant Major Russo is happily married to Mrs. Paola and has two beautiful girls, Giorgia, and Simona. His motto is "Commitment is pushing yourself when no one else is around”.